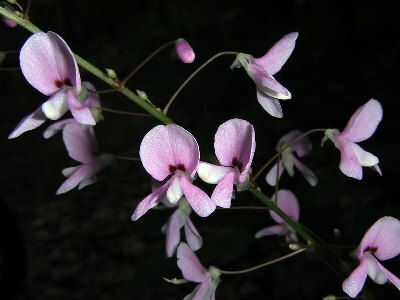 Desmodium nudiflorum.David G. Smith.www.discoverlife.org . (Accessed 5/2014). Desmodium nudiflorum is a perennial herb living 10 years or more, mostly solitary (Bierzychudek 1982), stem forked at base one stem sterile, to 30 cm, leaves spiraled at top; the other stem flowering to 1 m, usually leafless. 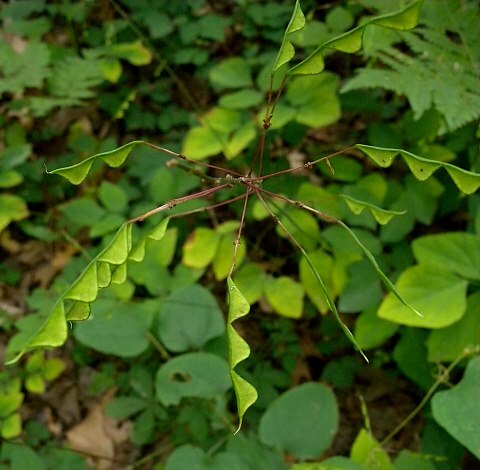 Desmodium nudiflorum leaves. John Hilty. Illinois Wildflowers. illinoiswildflowers.info (Accessed 2/2018). Leaves alternate, 3-parted, leaflets egg-shaped, terminal leaflet 4-10 cm long, to 8 cm wide, finely hairy both sides, pale-waxy below. Flowers pink-purple, 0.6-0.8 cm long, pea-flower-shaped, stamens all together around stigma; inflorescence of erect unbranched clusters; blooms July-Aug.
Desmodium nudiflorum fruit. John Hilty. Illinois Wildflowers. illinoiswildflowers.info (Accessed 2/2018). Fruit dry, finely bristled, 2-4 segments, jointed between seeds, breaking apart; individual fruits (loments) 0.6-1.0 cm long, to 0.4 cm wide, separated by broadly “U” shaped spaces; dispersed by clinging to fur or clothing (Matlack 1994), fruiting stem ca 1.5 cm. 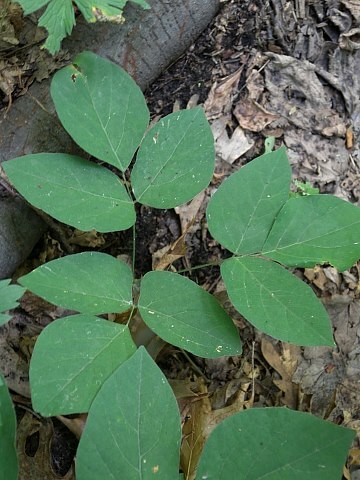 Habitat: Rich woodlands, shade tolerant.